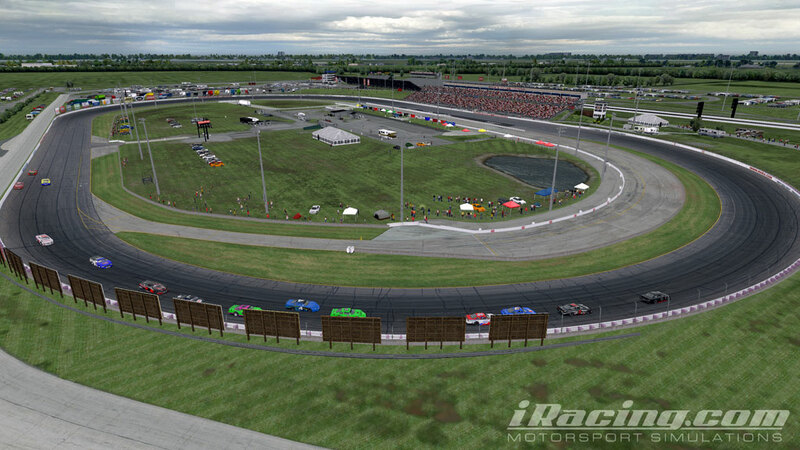 Lucas Oil Raceway is a .686 (just a skosh more than two thirds) mile oval located in Brownsburg, Indiana. It has a traditional symmetrical oval shape. The banking is moderate at 12° although it feels pretty flat when you’re driving on it. The racing surface is three full lanes wide with a low lane that is typically not used for racing and an apron below that. The preferred racing line is generally high, near the wall, but many drivers will use the middle of the track on entry and exit. Although the track is very wide, passing can be difficult because the actual racing line is not that wide. One good place to pass is at the exit of turn four. If you can get a good run through turns three and four, you can sometimes dip low around the middle-low part of the track and make a clean pass. Unfortunately, some drivers have no respect for your line and will also dip low. That usually results in the car on the outside spinning out, blaming the driver on the inside even though the driver on the outside was the one who dipped low and did not allow the driver on the inside enough room to race. It’s part of the deal at Lucas Oil Raceway. Sometimes you can also pass by running a low line in the corners. It’s very difficult to pull off and requires a lot of patience. You almost have to pull a dirt-racing-style slide job to do it, although you’re simply drifting up on exit more than you are sliding. When you drift up in front of the car on the outside, it forces the other driver to lift briefly because he will have more momentum than you have. If you’re not familiar with how to diamond a corner, you will need to learn how to do that at Lucas Oil Raceway. This is also known as a double apex. We often hear and say “turn 1, turn 2, turn 3, turn 4” on ovals. What you really have is more like turn 1 entry, turn 1 exit, turn 2 entry, turn 2 exit. It can be confusing for those new to oval racing to hear “turn 3” or “turn 4.” On short ovals in particular, there really are only two turns. That’s not really the case so much with Lucas Oil Raceway. The turns are so long that it’s best to drive them as four distinct corners. That’s where “diamonding” aka the double apex comes in. There on the left you see a very simple diagram I made with my Crayolas. The turns are exaggerated (the track actually looks a little bit like Indianapolis Motor Speedway with that short chute, or tiny straightaway between the corners) to better illustrate the concept of diamonding a corner. You can see now why it’s called a double apex. You apex on entry and on exit. When you make one complete lap, your live takes the shape of a diamond (sort of), hence the technique also became known as diamonding the corner. As the diagram shows, you turn in, drift up, turn down, then drift up again. For Lucas Oil Raceway, my line goes something like this. I ease into the corners with light trail braking and my left side tires on the dashed line. Sometimes you can brake a little harder but only do it when you really need it, otherwise you are going to wear out your tires. When I hit the corner right, the car drifts up in the center and will usually get pretty close to the outside wall. As I exit the corner, the car will naturally turn lower (on a properly driven decent setup) and I usually end up with my left side tires somewhere around that solid line in the middle of the track. Everyone’s line will vary some, but that’s a good indication of where your car should be positioned on the track. Typically, you’re probably going to exit the corner a little lower than you enter. The idea is to get the car pointed as straight as you can, get back on the throttle sooner/harder and drift to the outside wall on exit. You want a good clean, fast exit for that straightaway. With practice, you’ll be turning great laps on the track. Check the OSR Setup Repository for plenty of great setups for this track.